Have the Tories really lost a third of their vote? Since the last election, a third of Tory voters have switched how they say they’d vote. While the current Tory voting intent is kept up a little by support gained from elsewhere, the permanent loss of so many of their 2010 voters would rule out any chance of the Tories being in the next government, let alone winning a majority. But this is how things stand at the moment, and the election could still be almost three years away. New data from Lord Ashcroft suggest that the lost votes aren’t that far from the Tories’ reach. On the question of where the 2010 Tory vote has gone, the single biggest group of defectors is those who say they don’t now know who they’d vote for. After that, UKIP have slightly more than Labour, with a small number saying they wouldn’t vote. The table below shows the various pollsters’ latest scores for this. The results are pretty consistent across pollsters and some of the differences are explained by alternative weighting practices. So excluding the don’t knows, the defectors have split fairly evenly between those who’ve gone to the right and those who’ve gone to the left of the Tories. If this were to happen in a ballot (eg at the 2014 European elections), such a substantial boost for UKIP would destabilise the government, giving increasing ammunition to rebellious Tory backbenchers. Equally, defections of votes from the Tories directly to Labour count double in the parties’ head-to-head scores. So the table spells very bad news for the Tories. 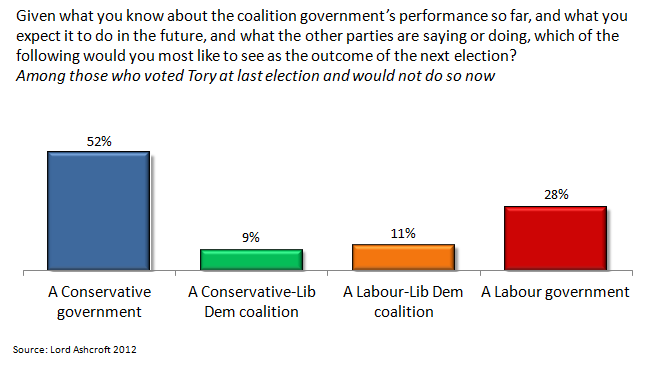 But the new data from Ashcroft suggest that many of those voters may not yet have given up on the Tories. His poll looks specifically at those who voted Tory in 2010 and now would not, with a large enough base size to analyse them separately. Despite no longer saying they would vote Tory, comfortable majorities of defectors still say they trust Cameron and Osborne more than Miliband and Balls to run the economy (76% vs 24%), and most think that Cameron would make the best PM (69% vs 21% for Miliband and 10% for Clegg). Of course this isn’t altogether surprising since we’ve seen that only about 17% of the defectors would go to one of the other main parties. This touches on the main problem with giving too much weight to voting intent questions at the moment, years away from an election. They ask people which party they currently favour, not which party they actually want to run the country. This clearly overestimates the potential gains: it can’t be right that the Tories would be up to 39-40pts (more than they actually got in 2010) if they were to regain just half their lost votes without winning more. The difference comes down to discrepancies between how many people apparently say they voted Tory in 2010 (once the polls are weighted) and the numbers who actually did. Of course it also matter which of the defected voters are the ones who are still open to the Tories’ charms. People who’re currently counted as likely Labour or Lib Dem voters would be more helpful for the Tories to win back at the general election than others. Yet UKIP voters may well be more winnable in a general election, when they’re unlikely to be realistic challengers for seats (if you doubt this, compare UKIP’s score of 16.5% in the last Euro elections with its score of 3.1% in the last general election). But the bottom line is that the Tories have a pool of former voters, who are currently not intending to vote Tory, but could potentially come back. This isn’t to say that the government is succeeding in winning them back: it’s entirely possible that they’re moving further away from the government. But it’s another reason why the Tories shouldn’t be written off for 2015. This entry was posted on Wednesday, July 25th, 2012 at 22:47	and is filed under Politics. You can follow any responses to this entry through the RSS 2.0 feed. Both comments and pings are currently closed.